A doggie salad may be a highly appreciated treat. Despite the belief that dogs are strictly carnivorous, they're actually omnivores that eat a wide variety of plant material -- even in the wild. Like humans, dogs require the nutrients found in a host of vegetables and fruits; however, a few fruits and veggies are poisonous to your pooch. Dark green vegetables are highly nutritious to both humans and dogs. Broccoli, for example, is a great source of vitamin C, folic acid, beta carotene and calcium. Other members of the cabbage family are also highly nutritious for your pooch. Spinach is a powerhouse for iron, as well as supplying calcium, potassium and various antioxidants. Green beans and peas are also a pooch favorite; consider using longer, frozen green beans as a nutritious treat that also gives your dog the satisfaction of crunchiness and chewing. Some colorful vegetables are also a pooch favorite as far as taste and nutritional value. Carrots add sweetness to your dog's meal while providing beta-carotene and other important nutrients. They are high in sugar, though, so feed sparingly. Sweet potatoes are another favorite; many commercially available treats are now using sweet potato as a primary ingredient. 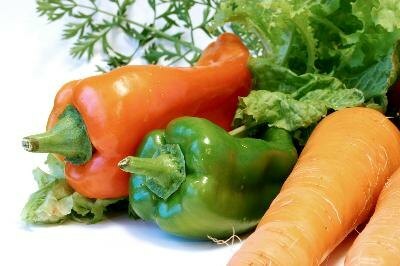 Bell peppers, particularly red ones, provide beta carotene and fiber, as well as other nutrients and antioxidants. Fruits are simple sugars: the energy foods of the natural world. Just like with people, fruits can give a flow of energy to your body while being sweet and enjoyable. More so than vegetables, however, fruits are considered more toxic to your dog. In many cases, it is simply the seeds, pits or stems that are poisonous. Give your dog a sliced apple with the skin attached and seeds removed as a healthy treat; or even some tomato if your pooch will eat it. Unfortunately, feeding your pooch healthy fruits and vegetables isn't as simple as giving it what you would eat. Some may cause severe illness or even death. Apple seeds, apricot pits, cherry pits and peach pits are all toxic to dogs, although the fruit is OK. Avocado and onions are particularly dangerous; raisins and grapes can cause severe problems in your pooch. What Sort of Frozen Vegetables Are Good for Dogs? Are Sunflower Seeds Dangerous for a Puppy? What Happens if a Dog Eats Cat Food for a Long Time? Are Raw Egg Whites Good for Cats & Dogs? What Vegetables Can I Feed My Dog?